Two stamps can be used to pay a letter up to 100gr. 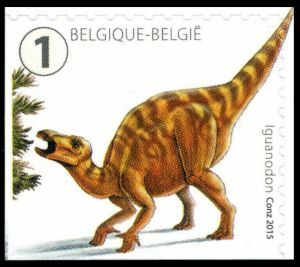 On September 7, 2015, first time since 1966 when one of the first dinosaur stamps (Iguanodon) issued in a set of 7 values dedicated to Belgium's museums , Post Authority of Belgium issued a set of 10 self adhesive stamps of dinosaurs and some other prehistoric animals. All stamps are of the same domestic rate. 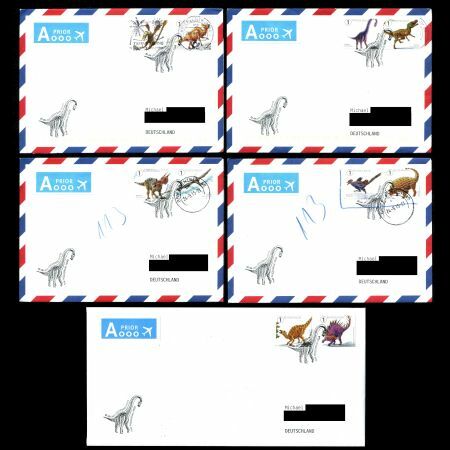 One stamp can be used to pay a letter of the weight up to 50 gr. 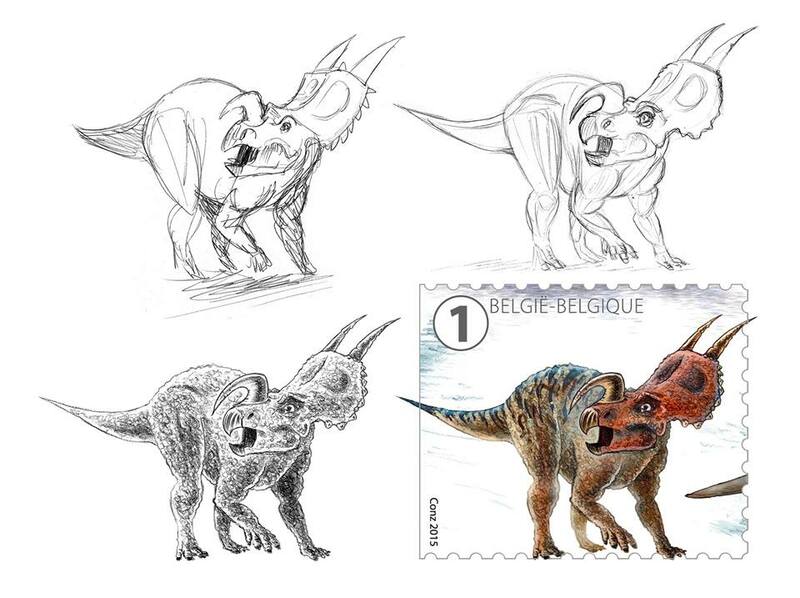 Two stamps are enough to pay a postage of a letter up to 100 gr. 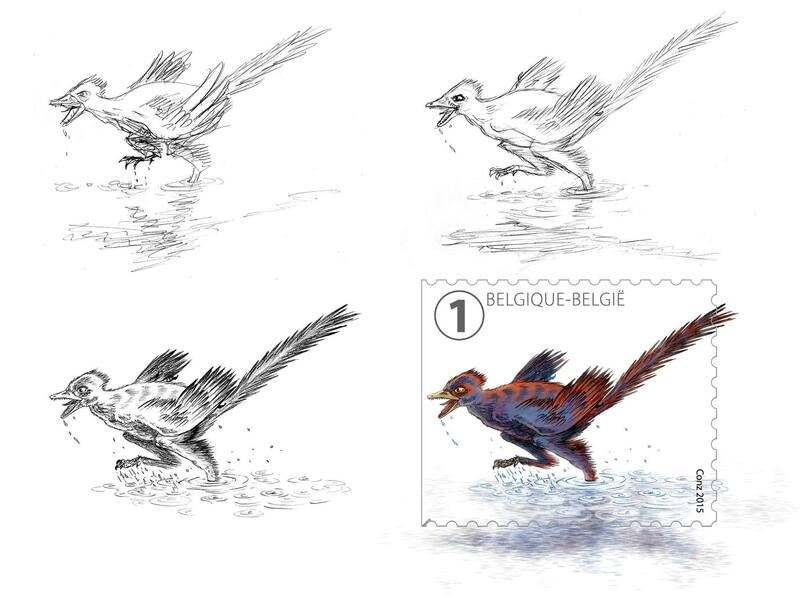 These stamps designed by Belgian cartoonist/designer Conz –the pseudonym of Constantijn Van Cauwenberghe. “Bpost came to me to make this stamp series, probably because I had previously illustrated dinosaurs in comics. 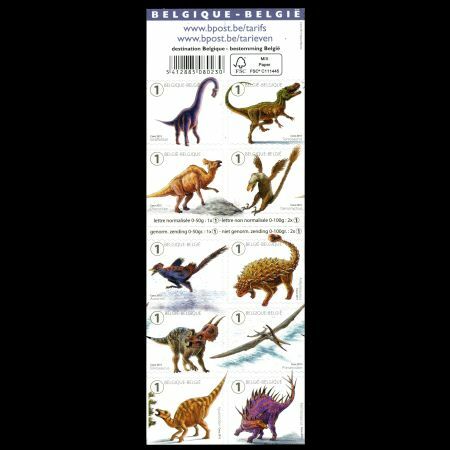 After creating a plan I made a selection of ten animals, which were a diverse mix of different types: dinos with a Belgian link, with an impressive appearance. 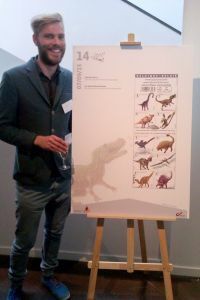 I deliberately chose not to use the more commonly-known species, such as Tyrannosaurus Rex, Triceratops, or Stegosaurus, but rather their lesser-known cousins such as the Torvosaurus, the Einiosaurus and Kentrosaurus. As a base I used skeletal reconstructions. Then I did some research and also used my imagination to create ‘realistic’muscle and fat mass to fit each animal – adding skin, feathers and hair where appropriate. Due to lack of evidence, the colours are of course entirely speculative. I’ve chosen striking colours so that the stamps would stand out a bit. 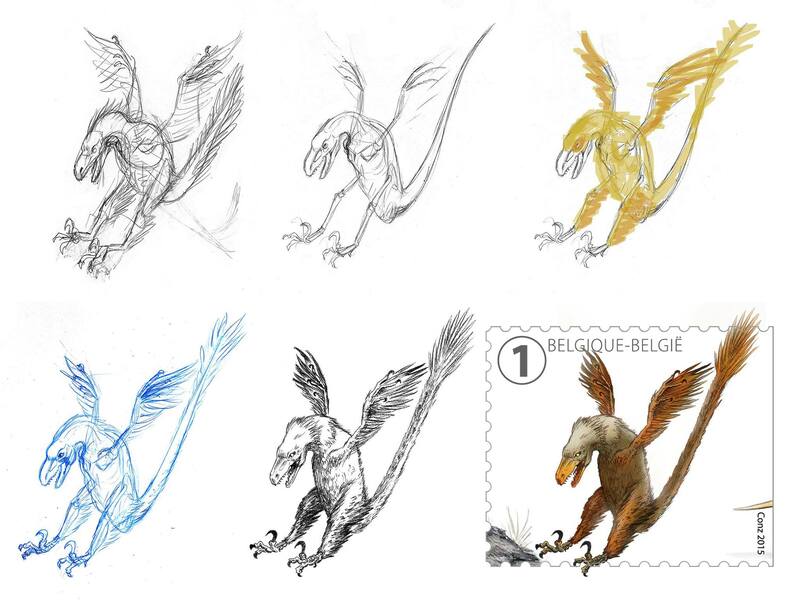 For colour patterns I have gained inspiration from savannah animals and many birds.” he says. 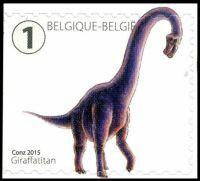 Giraffatitan, meaning "giant giraffe", is a genus of sauropod dinosaur that lived during the late Jurassic Period (Kimmeridgian-Tithonian stages). 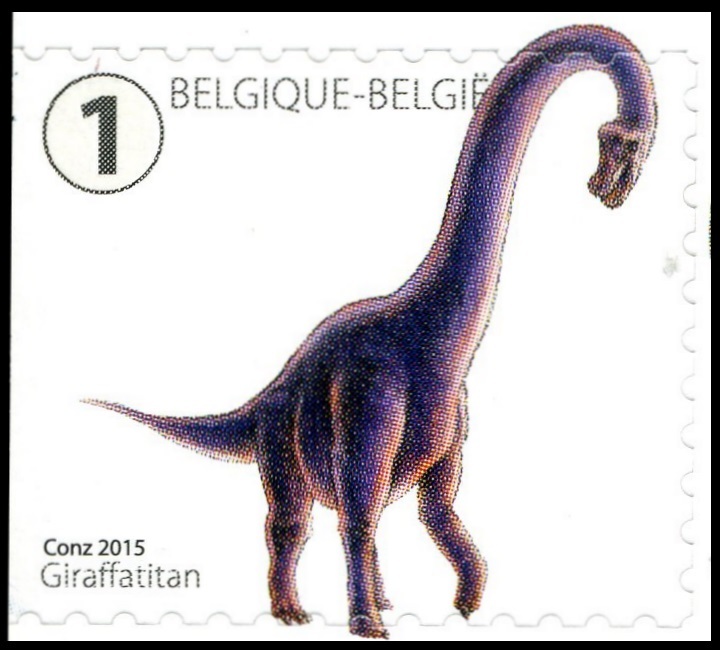 It was originally named as an African species of Brachiosaurus . Giraffatitan is one of the largest animals known to have walked the earth. 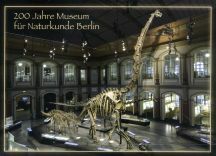 A famous specimen of Giraffatitan brancai mounted in Museum für Naturkunde (Berlin) is one of the largest, and in fact the tallest, mounted skeletons in the world, as certified by the Guinness Book of Records. 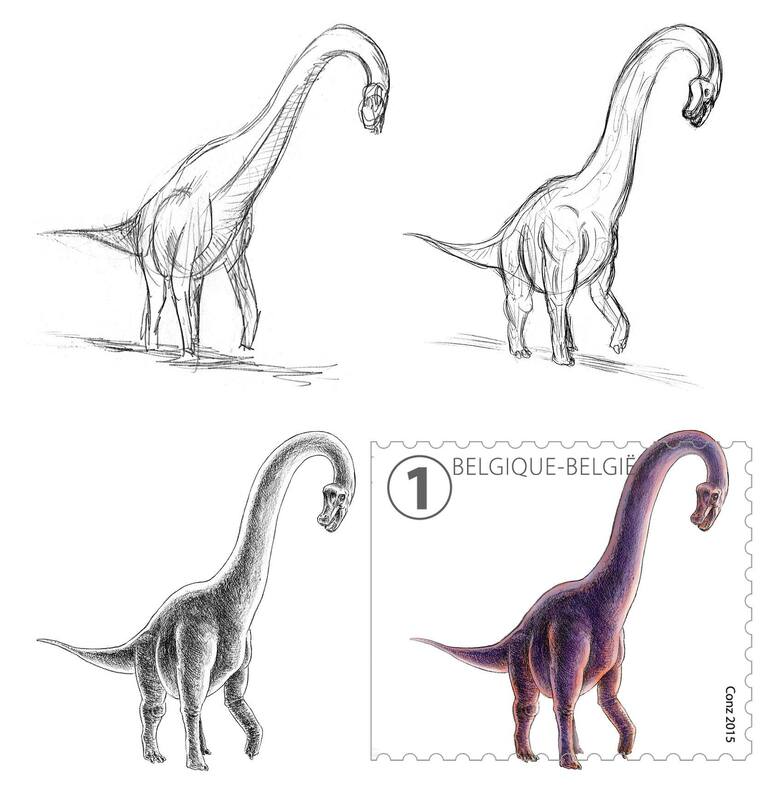 Giraffatitan brancai was first named and described by German paleontologist Werner Janensch in 1914 as Brachiosaurus brancai, based on several specimens recovered between 1909 and 1912 from the Tendaguru formation of German East Africa. German East Africa was, of course, a German colony between 1885 and 1919, when it was broken up among Britain and Belgium under the Treaty of Versailles, today Tanzania. It is known from five partial skeletons, including three skulls and numerous fragmentary remains including skull material, some limb bones, vertebrae and teeth. It lived from 145 to 150 million years ago, during the Kimmeridgian to Tithonian ages of the Late Jurassic period. 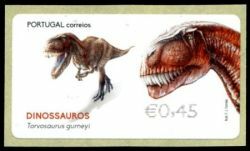 Gurney' (named in honor of the famous American paleoartist James Gurney – creator of the utopic world of Dinotopia, who also designed dinosaur stamps for USA in 1997 and Australia 2013), were found a few years ago into a cliff near the Portuguese da Praia Vermelha, near of Lisbon. After intensive research showed that the animal was about ten meters long and must have weighed about four to five tons. 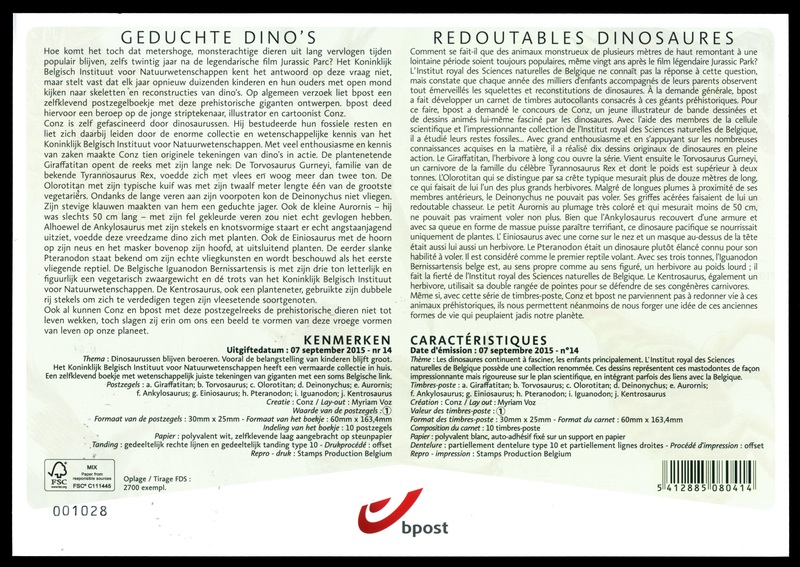 A Dutchman found the bones, but it was the Belgian Dr. Christophe Hendrickx, a specialist in dino's PhD student at the New University of Lisbon, who discovered that it was a new species. 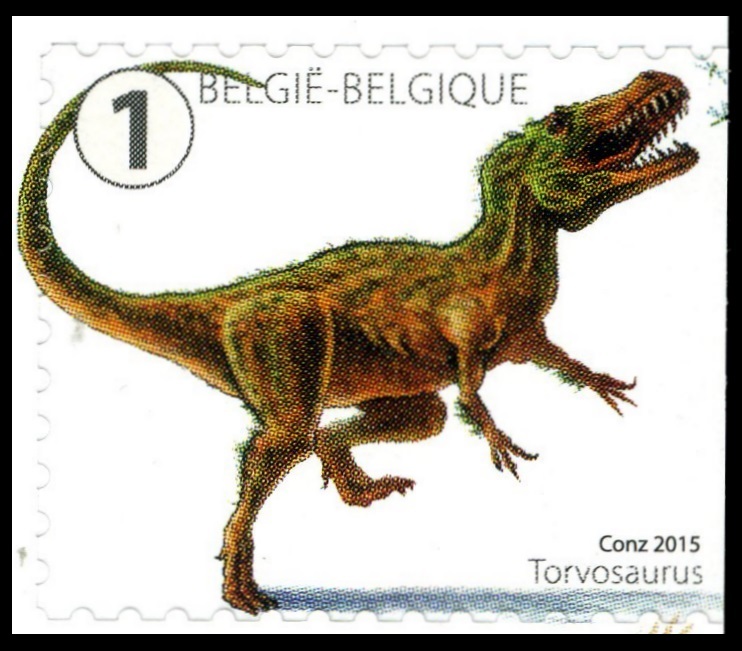 At first it was thought that it was a Torvosaurus tanneri , a carnivore that lived in North America. However, detailed examination of Dr. Hendrickx appeared that it was a different kind. The Torvosaurus gurneyi lived in Portugal, Spain, France and Andorra and has a lot of similarities with the Tyrannosaurus rex. Like the famous T-rex Torvosaurus had the short arms, razor-sharp teeth of about ten centimeters long and he used his claws to tear its prey apart. The two carnivores may, however, never met each other. The Torvosaurus gurneyi lived in the late Jurassic, about 150 million years ago. He was probably the biggest meat eater who walked, because the bigger Tyrannosaurus rex came only in the Cretaceous, some 70 million years ago. At that time the Torvosaurus was already shut down for a while. 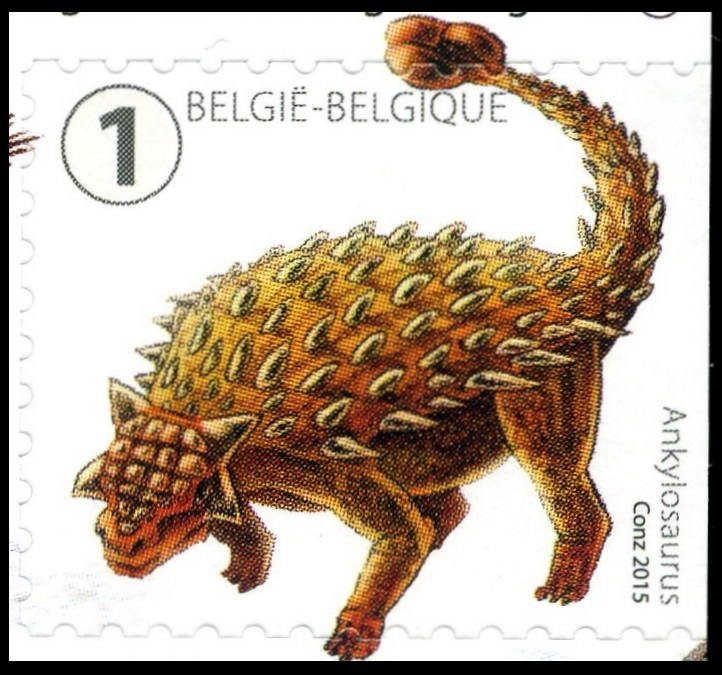 Ankylosaurus is a genus of thyreophoran dinosaur. 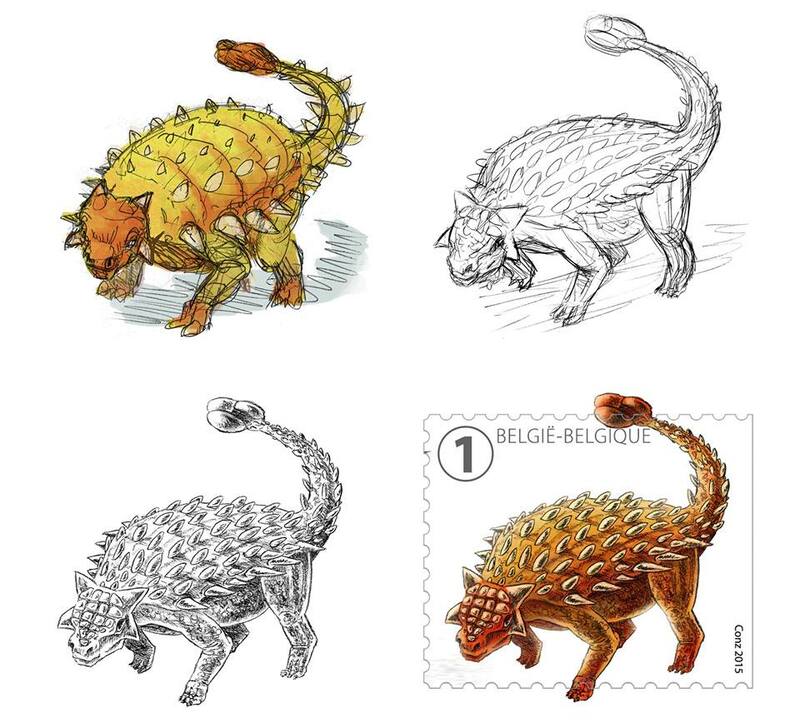 Fossils of Ankylosaurus have been found in geologic formations dating to the very end of the Cretaceous Period, between about 68–66 million years ago, in western North America, making it among the last of the non-avian dinosaurs. It was named by Barnum Brown in 1908, and the only species classified in the genus is A. magniventris. A handful of specimens have been excavated to date, but a complete skeleton has not been discovered. Though other members of Ankylosauria are represented by more extensive fossil material, Ankylosaurus is often considered the archetypal member of its group. The largest known ankylosaurid, Ankylosaurus measured up to 6.25 m (20.5 feet) in length, 1.7 m (5.6 feet) in height, and weighed 6 tonnes (13,000 lb). It was a quadrupedal animal, with a broad, robust body. It had a wide, low skull, with two horns pointing backwards from the back of the head, and two horns below these that pointed backwards and down. The front part of the jaws were covered in a beak, with rows of small, leaf-shaped teeth further behind it. It was covered in armor plates, or osteoderms, with bony half-rings covering the neck, and had a large club on the end of its tail. Bones in the skull and other parts of the body were fused, increasing their strength, and this feature is the source of the genus name. Einiosaurus is a medium-sized herbivorous centrosaurine ceratopsian dinosaur from the Upper Cretaceous (Campanian stage) of northwestern Montana. The name means 'buffalo lizard', in a combination of Blackfeet Indian eini and Latinized Ancient Greek sauros; the specific name (procurvicornis) means 'with a forward-curving horn' in Latin. Kentrosaurus is a genus of stegosaurian dinosaur from the Late Jurassic of Tanzania. 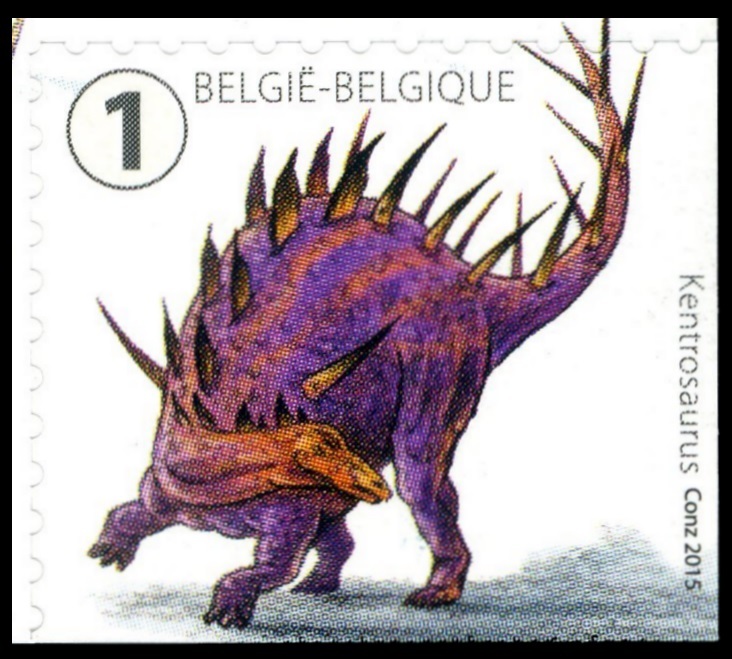 The type species is K. aethiopicus, named and described by German palaeontologist Edwin Hennig in 1915. 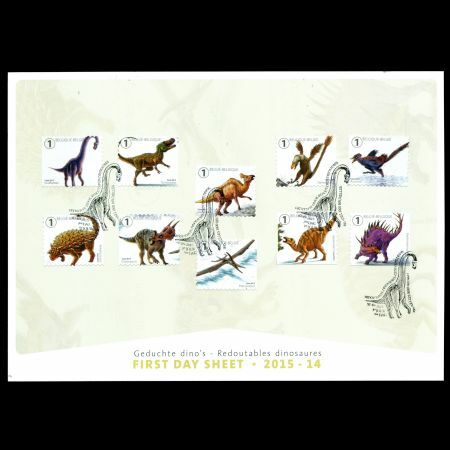 Often thought to be a "primitive" member of the Stegosauria, several recent cladistic analyses find it as more derived than many other stegosaurs, and a close relative of Stegosaurus from the North American Morrison Formation within the Stegosauridae. 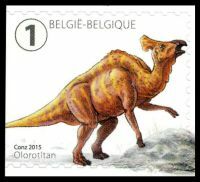 Olorotitan was a genus of lambeosaurine duckbilled dinosaur from the middle or latest Maastrichtian-age Late Cretaceous, whose remains were found in the Tsagayan Formation beds of Kundur, Amur Region, Far Eastern Russia. 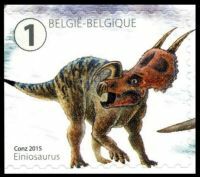 The type, and only species is Olorotitan arharensis whose holotype specimen, consisting of a nearly complete skeleton, was described by Belgian scientist Pascal Godefroit ( director of earth and life sciences at the Royal Belgian Institute of Natural Sciences ) in mid-2003. 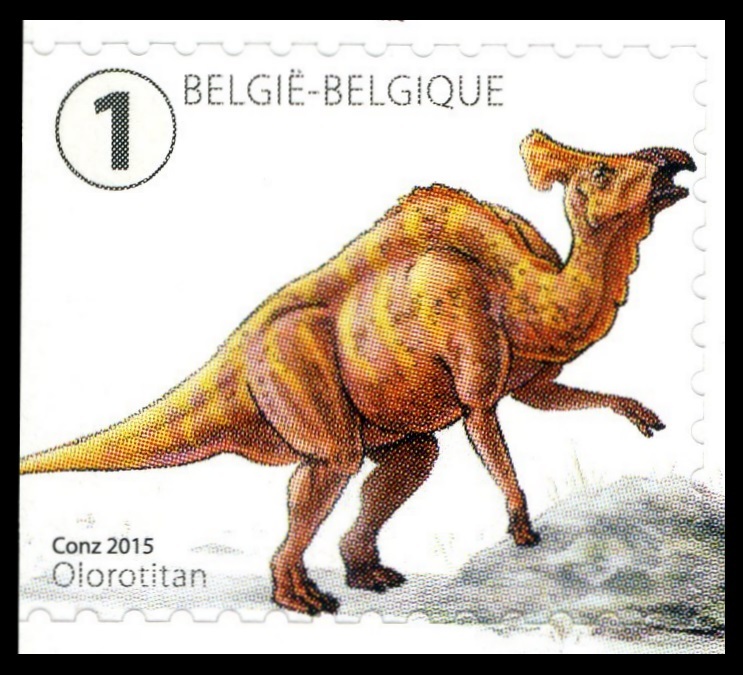 The generic name Olorotitan means "gigantic swan", while the specific descriptor arharensis refers to the location of the fossil find at Arhara County. 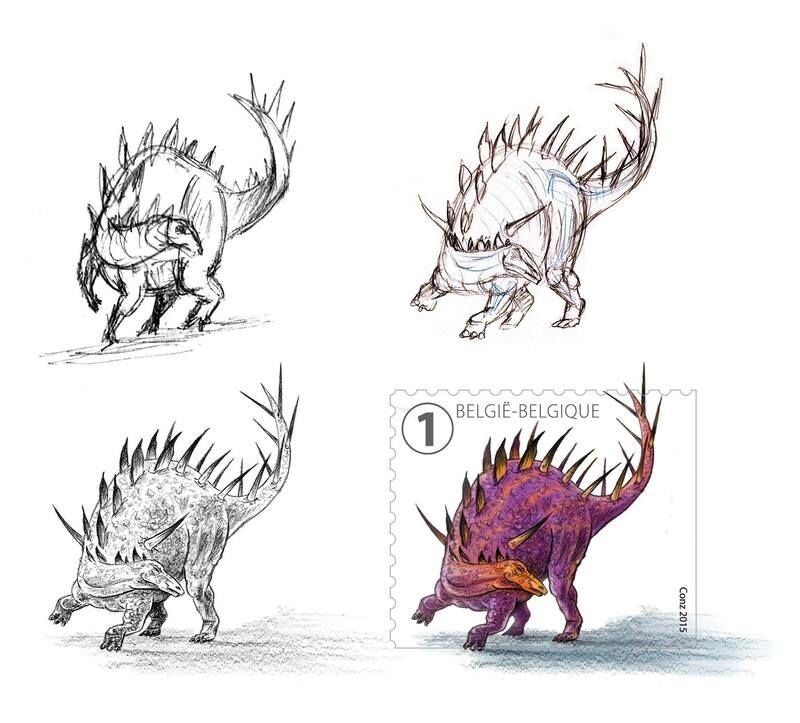 Olorotitan is distinct from other crested duckbills by its possession of an unusual crest that points backward and takes on a hatchet or fan-like shape. 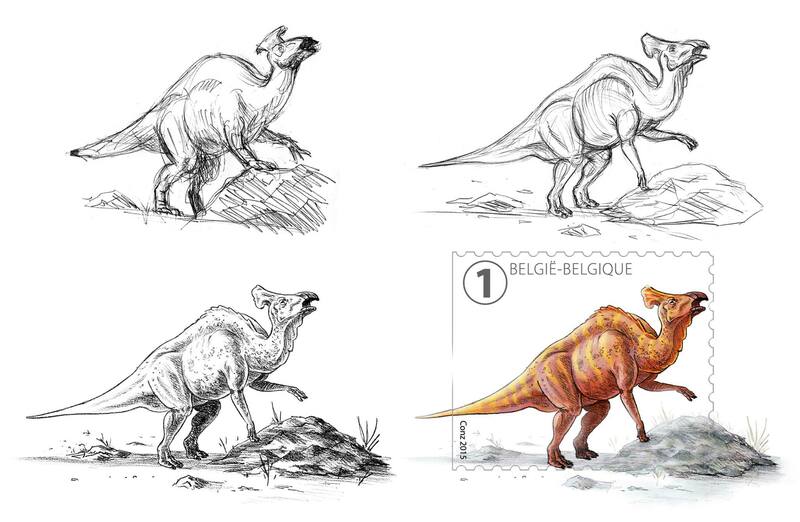 Its discovery has implications for the diversity of lambeosaurine hadrosaurids. 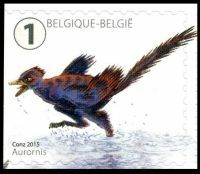 Aurornis was described from a sedimentary rock fossil in 2013. The fossil was purchased from a local dealer who said it had been unearthed in Yaoluguo in western Liaoning, China. Subsequent analysis confirmed it came from the Tiaojishan Formation, which has been dated to the late Jurassic period (Oxfordian stage), approximately 160 million years ago. The fossil features traces of downy feathers along the animal's tail, chest, and neck. It was only partially prepared at the time of purchase with the feathers not showing, and bore no signs of forgery. 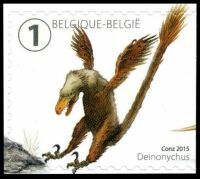 of the swift bipedal hypsilophodontids of the mid-Jurassic and the duck-billed dinosaurs of the late Cretaceous. While many species have been classified in the genus Iguanodon, dating from the late Jurassic Period to the late Cretaceous Period of Asia, Europe, and North America, research in the first decade of the 21st century suggests that there is only one well-substantiated species: Iguanodon bernissartensis, which lived in Belgium and possibly elsewhere in Europe, between about 126 and 125 million years ago. In 1878, dozens of Iguanodon skeletons were discovered in a coal mine in Bernissart, 322 m below the ground. 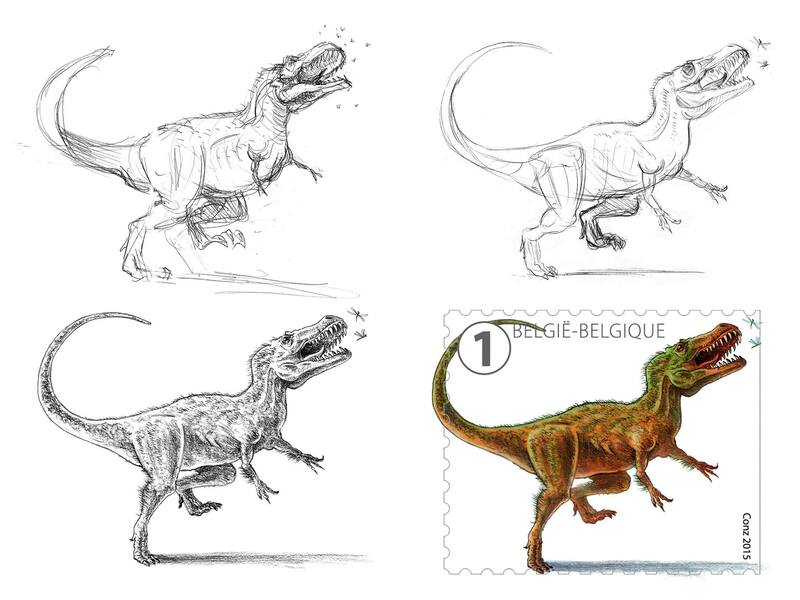 At the time, their proximity was considered proof that some dinosaurs were herd animals. They were mounted by Louis Dollo and set the standard that was followed for over a century. 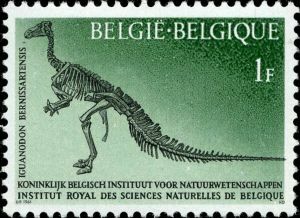 Nine of the twenty-nine skeletons are currently on display at the Royal Belgian Institute of Natural Sciences, and one at the Bernissart Museum. The two museums even made an error they acknowledge with humour : they displayed the skeletons "standing", suggesting that the dinosaurs were bidepal, which is not the case. 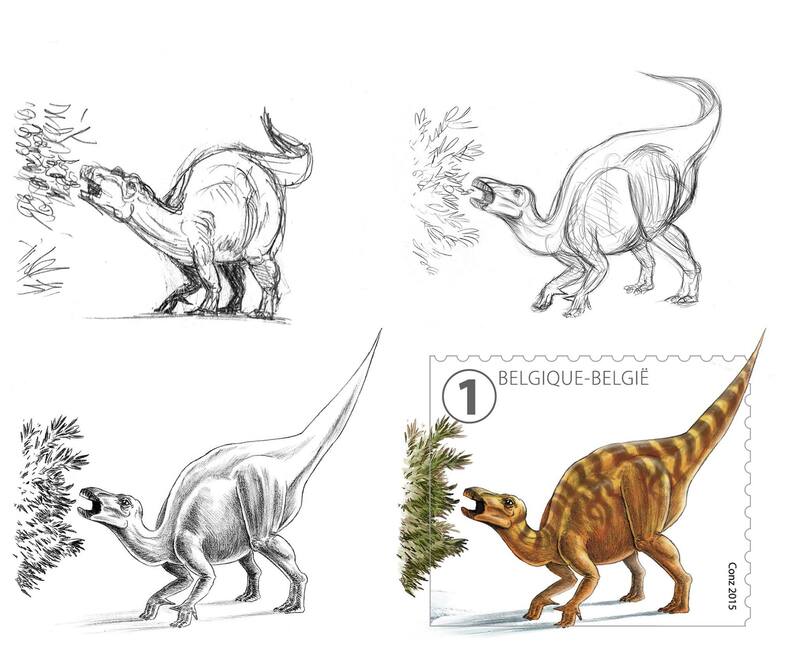 Iguanodon were large, bulky herbivores. Distinctive features include large thumb spikes, which were possibly used for defense against predators, combined with long prehensile fifth fingers able to forage for food. 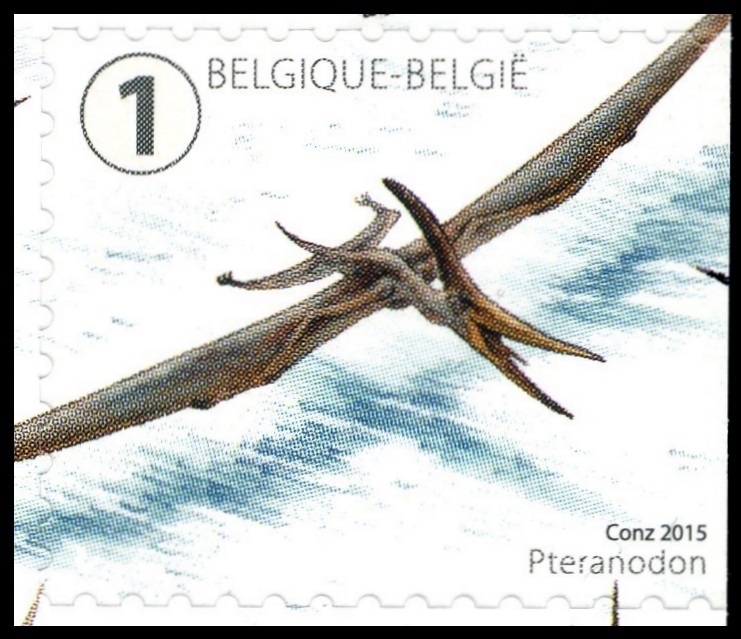 Pteranodon is a genus of pterosaurs which included some of the largest known flying reptiles, with wingspans over 6 metres (20 ft). It existed during the late Cretaceous geological period of North America in present day Kansas, Alabama, Nebraska, Wyoming, and South Dakota. 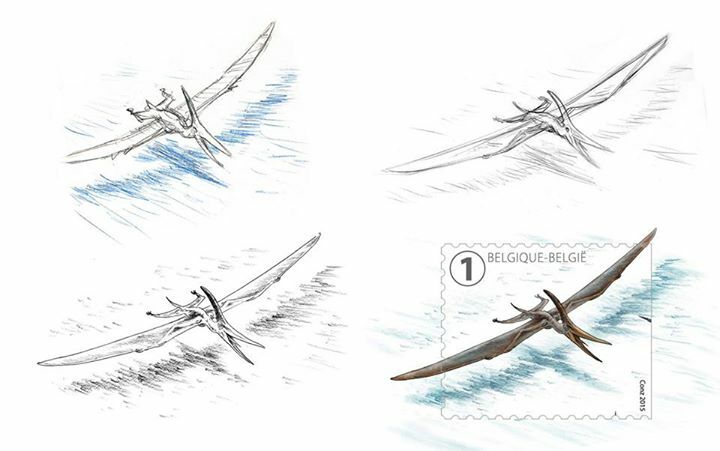 More fossil specimens of Pteranodon have been found than any other pterosaur, with about 1,200 specimens known to science, many of them well preserved with nearly complete skulls and articulated skeletons. It was an important part of the animal community in the Western Interior Seaway. 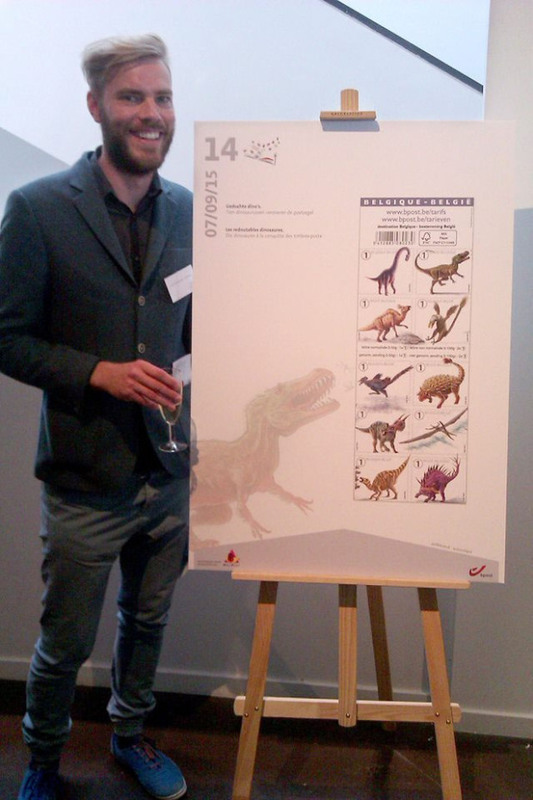 Pteranodon was not a dinosaur. By definition, all dinosaurs belong to the groups Saurischia and Ornithischia, which exclude pterosaurs. 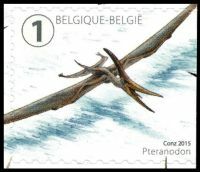 Nonetheless, Pteranodon is frequently featured in dinosaur books and is strongly associated with dinosaurs by the general public.